The 2019 CLS set to debut next week at the 2017 Los Angeles Auto Show will mark the introduction of the next step in the evolution of Mercedes-Benz’s “sensual purity” design philosophy. It’s a design philosophy where sculptural, three-dimensional surfaces take focus in creating character, as opposed to creases or overly complex graphics favored by other makes. It’s minimalism at its core, mixed with sensuality presented through curves and forms. Mercedes previewed the latest evolution of its design philosophy in April with the unveiling of the A Sedan concept at the 2017 Shanghai auto show. With the 2019 CLS in L.A., we’ll see it on a production model for the first time. In the teaser video for the swoopy sedan, we can see the headlights have taken on a more angular look. The grille is rounded and almost mimics the aggressive Panamericana design favored by Mercedes-AMG, and it flows into a hood with an almost fluid-like surface. Prototypes spotted in the wild provide a good indication of what’s to come. And a teaser shot of the interior reveals what occupants will be treated to: dual screens, one for the instrument cluster and the other the infotainment system, are enclosed within a single pane of glass and are joined by turbine-style air vents. We’re still waiting for all the details but the 2019 CLS is expected to be fitted as standard with Mercedes’ new turbocharged 3.0-liter inline-6. 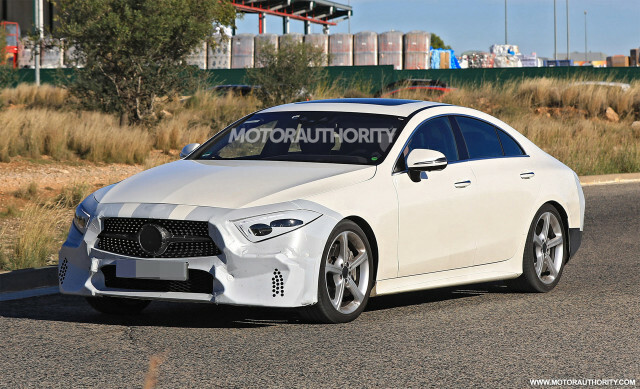 Above this is expected to sit a new Mercedes-AMG CLS53 also packing an inline-6 albeit with a high-powered electric motor to boost output to V-8-like levels. There won’t be a direct replacement for AMG’s existing CLS63, as the Affalterbach tuner is planning its own fastback sedan previewed by the GT concept unveiled at the 2017 Geneva auto show. We’ve also spied prototypes for this model which is expected to debut next January at the 2018 North American International Auto Show in Detroit. The L.A. Auto Show starts November 29. For more coverage, head to our dedicated hub. Win a free HTC 10 from Android Central and HTC!